One of the film clips on the second DVD was contributed by Kluge’s friend Tom Tykwer. Tykwer’s short sequence contemplates on things that are attributed with characteristics they naturally do not have. “Der Mensch im Ding” – the man within the object – relies on the most advanced digital filming techniques of its contemporary moment. The sequencing software edits the image such that the frame zooms in and out, rotates, and moves to the different objects. The entire sequence is introduced by a zoom from the sky to an everyday life street scene – a woman rushing by an old house. The scene then freezes and a voice over analysis of the different elements in the image takes over. The analysis of the different objects in the scene stretches from the size of the object to the history of production and its usage. The contemplative narration accompanying the 360̇ degree rotation and zoom images of the commodities like the doorbell, parts of the street, as well as the woman’s skirt, tights and boots, represent a way of using this brand new technology of the 360͒ degree camera in a historically critical way. By adding to the narration engaged in the commodities’ history other narrations just loud enough to hear them without having to pay attention, Tykwer creates a multi-layered sound structure that indicates the multi-layered history and “metaphysics” of the objects. In doing so, he contrasts the zoomed image: Although the camera with its new technology of an “all embracing” 360 degree lens gets as close as possible to the material object, it cannot fully capture its metaphysical and socio-cultural meaning but needs the voice-over to at least try to do that. 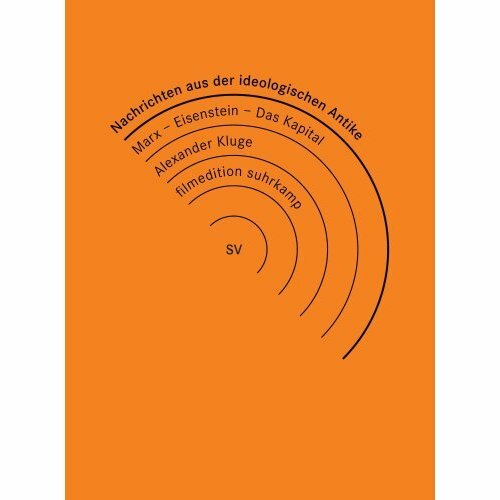 In Nachrichten aus der ideologischen Antike, both Kluge and Tykwer re-contextualize everyday scenes in a way that challenges the concept of realism and the idea of post-ideology. The socio-economical structure and relations behind what is perceivable as real is so complex that even the newest technology cannot fully represent it. Kluge’s form of montage points to a form of realism beyond what is perceivable as real, and it is in fact this form of montage and contextualization or even re-contextualization – images that we think we are familiar with but that indeed must be read differently in the context Kluge uses – that mark Kluge’s approach to the moving image, montage and finally also Realism.